Boris Kustodiev: Freedom Loan (1917) – Image shows a Russian soldier standing over groups of protesters, signifying the primacy of the war over domestic issues. It is undeniable that there were many contributing factors to the Russian revolutions of February and October 1917. Social unrest and political impotence certainly were the downfall of the Romanov dynasty and the Russian autocracy, however the catalyst for the Revolutions of 1917 was most-definitely the First World War. In order to understand the revolutions of 1917, one must look back to the revolution of 1905. Nation-wide strikes, the upheaval and destruction of gentry property, and the organization of the peasantry threatened the very sovreignty of the Tsar. Though the ‘October Manifesto’ produced by the tsarist government following the 1905 uprising effectively ended the revolution, it did not go far enough to please the more radical wings of the revolutionary movement. Many of these more radical factions would not be satisfied until the Tsar abdicated, something that Nicholas II was not ready to do. These factions did not go away however, and grew larger over time. One of the major facets of the October Manifesto was the creation of an elected lower house, called the Duma. Though the house was a body representing the people, the Tsar reserved the right to dissolve the Duma at any point. The Tsar could also enact laws in the time between the dissolution and election of a new Duma. This under-representation of the common people, the status quo for much of Russian politics even today, continued to foster resentment within the ranks of Russian society. The mass-dissatisfaction with the monarchy and the government in general was exacerbated by the onset of the First World War in 1914. The Manifesto had failed to provide social stability, and in this sense especially, the nation was not prepared for the war that was to come. As Gregory Freeze puts it, “[i]t was a sign of weakness, then, not strength, that the Russian regime that went to war in the summer of 1914 had successfully resisted becoming a functioning constitutional monarchy” (267). Though the Russian state was not truly prepared for war of this magnitude, it would not have appeared so to someone on the ground at the time. The Russian army was massive, over 1.4 million strong at the outset of the war (marxists.org), and was still largely mobilized following the Balkan Wars of 1912-1913. This meant that the army mobilized reletively quickly. Once the war was on, “Russia mobilized rapidly and intensively for a war everyone hoped would be brief, but which proved protracted and exhausting. The armed forces conscripted nearly seven million men in 1914 alone. More than eighteen million would serve during the course of the war” (1917 – Did the War Cause a Revolution?). This illusion would not last for long, however. The first major blow to Russia was the Battle of Tannenberg in late August 1914. Despite early gains while pushing into East Prussian territory and forcing the German army into retreat, the German forces, commanded by General Erich von Ludendorff, eventually pushed forward and broke through the Russian line, effectively splitting the Russian Army in half. After dividing the Russian forces, “The German Army turned West and attacked the flank of the Russian Second Army. Within four days of fighting, bogged down in lakes and swamps, the Russian Second Army was defeated… A week later, General Hindenburg led the Eighth German Army, bolstered by reinforcements, to drive the Russian First Army completely out of Prussia” (marxists.org). The Germans pursued the retreating Russian army, attacking wherever they could, and in the First Battle of the Masurian Lakes the remaining Russians took heavy casualties. By September 13th what remained of the Russian army had retreated to safety behind Russian borders. The excursion into Prussia resulted in no territorial gain, costing the Russians nearly 300,000 men killed, wounded or captured (wikipedia). The Russians fared much better in Austria-Hungary, capturing the region of Galicia by early September. The Germans quickly sent reinforcements to aid their allies and began an offensive in mid-April of 1915. The Russian forces were ill equipped to defend against the German offensive, “Problems of supply and logistics, especially where munitions were concerned, plagued the Russian army. Chronic shortages of firearms meant that soldiers often relied on the guns of their dead comrades. Ineptitude began at the very top of the Russian general staff” (Digital History Reader). The German forces forced the Russians into retreat, “In the course of the ‘Great Retreat’ of 1915, Austro-German forces pushed the Russians out of eastern Poland at a cost of nearly one million Russian casualties and another million prisoners” (Digital History Reader). These losses were crushing to Russia in the army and at home. Tsar Nicholas II had foolishly taken personal control of the armed forces, which made him liable to criticism following the early military fiascoes. No one in Russian society was satisfied, “[f]or the propertied classes, the autocracy’s ineptitude in prosecuting the war fueled widespread disaffection and concern for the country’s future in the postwar world. In the lower levels of society, in the army, in cities, and in the countryside, tolerance of long-term deprivation, rationing, and a subsistence existence was running out” (Digital History Reader). Mass protest on the Russian home front hurt the war effort, and following the February Revolution of 1917 and the abdication of Nicholas II in early March the Petrograd Soviet issued “Order no. 1”, which restructured the army into a more representative and equal fashion. This order inspired dissension in the ranks. As Lewis Siegelbaum writes, “The first few weeks of the revolution witnessed the desertion of between 100,000 and 150,000 soldiers, most of whom were peasants anxious to return to their villages to participate in what they expected would be a division of the land. There was also a substantial tide of arrests of officers, particularly senior commanders, and their replacement by more popular individuals.” Before long the army was in shambles and defeat seemed more and more probable as time progressed. The Bolshevik Revolution of October 1917 toppled what remained of the previous regime and the Bolshevik government then sought to validate itself by promising fulfilling its promises of bringing bread and peace to Russia. 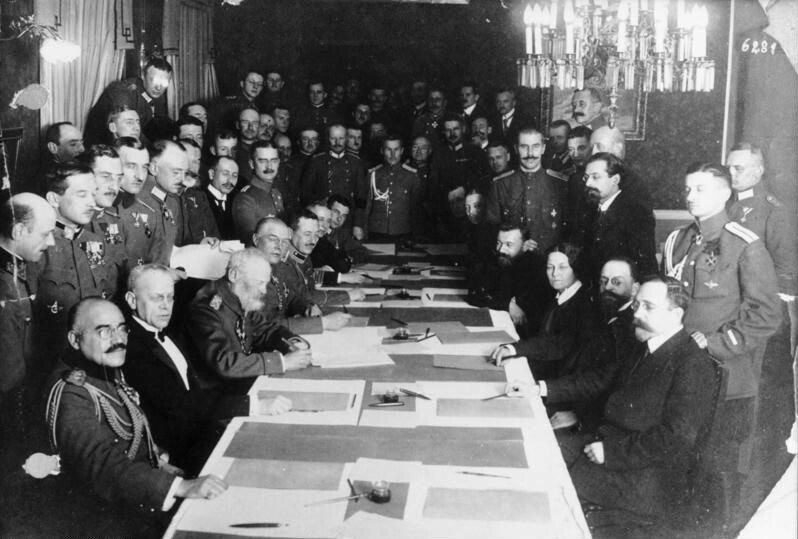 By the end of 1917 the soviet government sought an immediate end to hostilities and signed the treaty of Brest Litovsk, an armistice which took effect in march of 1918 and formally took Russia out of the war. Were it not for the military woes of the Russian army, the autocracy may have been able to control the populace and retain its power. The massive cost of war, both in resources and in soldiers, hampered the growth and productivity of the Russian homeland and put much of the lower-half of society in dire straits and a state of desperation. A situation which nurtures radical and revolutionary ideas, ideas that manifested themselves both in February and October of 1917. Digital History Reader. 1917 – Did the War Cause a Revolution? n.d. http://www.dhr.history.vt.edu/modules/eu/mod03_1917/context.html (accessed September 13, 2014). Freeze, Gregory L. Russia: A History. New York: Oxford University Press, 2009. Marxists.org. WW1 – Russia. n.d. https://www.marxists.org/glossary/events/w/ww1/russia.htm (accessed September 13, 2014). Siegelbaum, Lewis. Seventeen Moments in Soviet History. n.d. http://soviethistory.macalester.edu/index.php (accessed September 14, 2014). Wikipedia.org. First Battle of the Masurian Lakes. n.d. http://en.wikipedia.org/wiki/First_Battle_of_the_Masurian_Lakes (accessed September 14, 2014). —. The Battle of Tannenberg. n.d. http://en.wikipedia.org/wiki/Battle_of_Tannenberg (accessed September 13, 2014). kinda interesting angle, but way not complete..
Whats up! I simply want to give a huge thumbs up for the good information you will have right here on this post. I shall be coming again to your blog for extra soon. Sweet web site, super design and style, real clean and utilise genial. I really liked this post and the war you fully tied WWI into the revolution of 1917. It was very informative. I find it ironic how there were so many deserters in the army who went home to claim land because if they had lost the war to the Germans then they probably wouldn’t have any and to claim anyway. Great post. This really outlines the military conditions and factors that lead in to the revolution very well. It really seems like Russia kept getting involved in wars way over their head militarily. If their crushing defeat in the Russo-Japanese war didn’t prove to them that they were behind the rest of the world militarily, they then decided to take on Germany and the Austro-Hungarians, both far more advanced and professional armies than the Japanese. These engagements which seem foolishly un-winnable certainly pushed the Russian people in the direction of revolution. What a fine post! Looking at the significance of WWI in terms of the overall arc of the revolutions (1905-17) yields many good insights, among them, the importance of Order No. 1 to the collapse of the autocracy and the emergence of Dual Power. Nicely done! Nice post. This was enjoyable because it hit on a bunch of events but did so chronologically and connected them together. You raise an interesting point considering if the Tsar could have retained power were it not for the military failures. I think you’re right they may have been able to hold power longer but the revolution would probably have just been delayed until some later catalyst set it off. I agree. What I was trying to say was that the logistics of the war put a strain on the entire economy. Feeding, clothing, arming, and supplying millions of troops at a time diverted many resources that could have been vital to economic development and growth. This economic strain is what put a majority of the populace into dire straits. Regime change I feel was inevitable, but were it not for the war I do not feel that it would have happened at that time or in such a way. This is a great comprehensive outline and analysis of Russian military history during the decade following the revolutions of 1905 and the October Manifesto. When looking at Russian involvement in World War I in a vacuum, it appears that they simply were in no way ready for a war of such magnitude. In reality, while the the Russians may not have been as well trained or equipped as the Austria-Hungarians and Germans, they had the advantage of size on their side, along with the fact they had not fully demilitarized following the Russo-Japanese War. However, their military involvement’s impact on Russian social history is unmistakable and contributed greatly to the end of the Romanov Dynasty.